Second Life’s Tenth Birthday is on June 23, 2013, and the celebration is going to be the biggest birthday bash this virtual world has ever seen. There is a lot of buzz about Marianne McCann’s full-sim build, some of which was covered in prims, and the rest of which had signs asking folks not to take pictures. Top secret builds are always a fascinating draw for the public, so I decided to see if Mari would grant me an interview prior to the opening of her history-themed sim. SL Newser: Mari, you were not in Second Life™ from the beginning--you came in during the rush of 2006, as did I. However, you possess an enormous love for the history and anthropology of this virtual world. Marianne McCann: At heart, I’ve always been an explorer, no matter the world -- and part of that means understanding the history, the background. You know, getting a sense of what a place or thing is all about, and here, it became understanding the stuff that predates me, looking at how the world had evolved before I made an account in 2006. I found it fascinating to watch the evolution, and read the history of things that sound like almost mythical things. The tax revolt, the Jessie War... all these things that made the fabric of Second Life™. SL Newser: This is one of the first major builds I have seen you construct that does not focus on the Child Play community. Many people who do not know you here may come to know you as someone who is a genius of history, not a pioneer in the freedom to be whatever one wants to be here. What are your feelings about this? Marianne McCann: I’m actually okay with that, really. It’s a funny story, in a way, and one that typifies my Second Life™ I guess. I came to Second Life after hearing about it from friends, and felt it might be a good respite from actually doing a lot of community activism in my first life. Then, quite unexpectedly, found myself doing much the same here! “No matter where you go, there you are” became a very true thing. On the plus side, we've all come a long way since then. A lot of those battles have been won or lost. And really, it has allowed me to show off more facets of me. Like the interest in history, or some of the builds I've done in and for Bay City. That doesn't stop me from still keeping a foot in kid stuff, and staying watchful, but it gives me a more varied palate. SL Newser: Can you explain the process you went through in coming up with the design of the build? I really want a glimpse into your inspiration...and your perspiration. What was it like to conceive of a build this large ? Marianne McCann: Well, I have a bad habit when doing builds at the SL Birthdays. 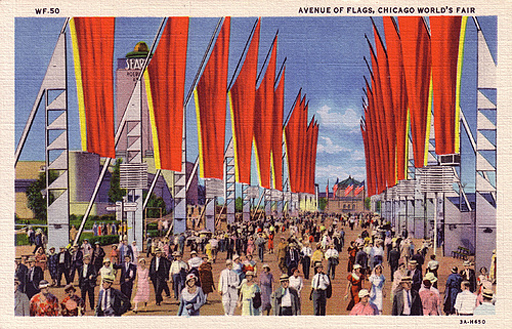 My first stop is to look at the World’s Fairs in the US in the mid-century. See, there’s that history interest, and in this case, I knew I wanted to showcase everything year by year, and give people a place to walk around and reflect. 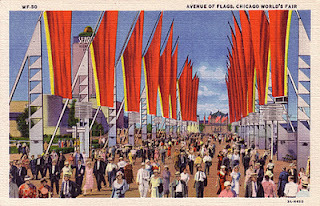 This build was inspired a bit by the Avenue of Flags at the 1933 Century of Progress Exhibition in Chicago, Illinois. The upright flagpoles come directly from it, I'll admit, but I opted to make it a plaza, with the pools and fountains to give it a more “park like” feel. The large arches in the back, feature the Second Life™ sun image from the old viewer as a fresco, to emphasize the passage of time. And of course the big box prims up there, a play on the old slogan: “It all started with a cube.” But ya, it winds though, with a sign or two for year to year, giving the highlights and some pictures, as well as the various items. 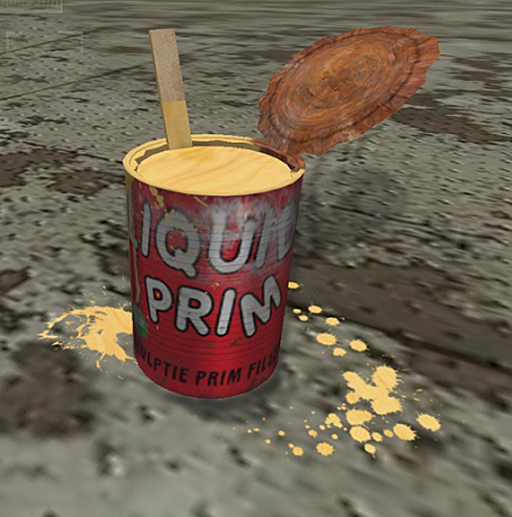 Most everything is from its actual years, with items dating back to early 2002 and textures back to December 2001! The first item on the walk is the remains of a slideshow that Linden Lab gave in 2001, at the Demonstration conference, talking about their upcoming Linden World project. It's fascinating to read through and get a sense of what Philip & Co. envisioned early on, and muse about how close it may have gotten. SL Newser: How have you been able to amass so many artifacts of the history of Second Life™ Who are your mentors, idols, etc? Marianne McCann: Well, in some ways, it just sort of happened. An inventory in the 95k range and all...but back in 2007, I believe, I was writing for the Metaverse Messenger, an in world newspaper, doing a kids page. I started to watch for interesting happening on the grid then. I spotted a big gambling protest in Pooley, and photographed it. Also, I got a couple of their protest signs, some of which I could not display on a General rated region! This led to me starting to collect items here and there relating to this history: protest signs, stuff from the tax revolt, then old maps, other items of note here and there, Eventually, well, you can see it all here, I suspect. SL Newser: Oh, and bears ? I guess the bears are too primmy? Marianne McCann: I actually donated a few to another build here: Bear Island. I would need a full sim just for that collection; I have over 400 Linden Bears, and some of them are, um, not exactly prim savers. It was my first collection, I suppose. I remember trawling through Ambelside hunting up bears. And mentors: I think that the SL History wiki, and all the work Oz Spade and Eggy Lippman put in on our history also helped fuel me, and Salazar Jack, too, and of course, Lalo Telling, who did some amazing history work. This build is actually dedicated in the memory of Lalo, who passed recently. A number of times while doing this build, I’d come across something and think: “Lalo would love this!” or “Oh, Lalo would know this.” For example, finding evidence about what may have been the first Second Life2 road network in Tehama via old pictures of Natoma, that sort of thing. Oh yes, Daniel Voyager. He puts so much heart into everything he does. SL Newser: What would you like folks to know about Second Life™? SL Newser: You have been quite open on your blog and elsewhere about your reasons for playing a child in Second Life™. What have been the positive and negative outcomes of this? Marianne McCann: Well, the positives are that, first off, folks know where I and other kids come from. It’s a “light a candle versus cursing the darkness” thing. It’s made things better for kid avatars, I think. Its helped people see what it is, what we’re doing, not thinking we're all here for some deviant purpose or whatever. Otherwise, what would they learn? Not from the stuff on Report Mainz or Sky News? That’s not the kids I know. The negative: Well, most of the negatives came out of ignorance of why I was a kid here, though I think that it has caused me to be a bit pigeonholed. People just think of me with kid stuff, or they think I’m going to be more radical, or...I dunno. I'm good with that! I've taken some pains to try to make this build as open as I can. I mean, so it's not just “my” history. I mean, hard for it to not be through my own lens, but I have tried to be objective A lot of the photos I’ve used here are ones I’ve shot, so it is through my eyes. However, it’s not “scenes of my family life,” or what have you. Marianne McCann: And there can be only one answer: Apple pie. With a slice of cheese. SL Newser: Is there anything you want to say about how you came into SL, why it clicked for you, and why you love it so? Marianne McCann: I had actually heard of SL way back. I had a first life boss who ended up being one of Linen Lab's first marketing guys. At that time there was no Mac client, and I saw no obvious value in buying into a service I could not even use, so I “filed it,” as it were. But come late 2005, early 2006 I had a couple friends who were here regularly, and raving about it all. I decided to come here for a week or two and see what the hubbub was all about. I wasn’t initially impressed. My computer was a bit slow for SL, even in those days, so the user experience was low. I could not even properly finish the tutorial on Orientation Island! The Ahern Welcome Area was a madhouse, and I quickly moved my home to the Sami Infohub. Then I met up with the folks I knew who were here. This is the funny bit. I had three friends: One was a young mouse in a family of furs, one was a kid out on her own, and one was a kid in a family. I thought was a bid odd but after I explored a bit what they were doing, seeing what they were up to, it seemed like quite a bit of fun. I ended up stretching those two weeks... a bit. We both grinned a lot at that statement. SL Newser: One last question: What do you forsee in the future for Second Life™? Marianne McCann: I’m going to tie that a bit to this display, in a way. When I started to write out all of the different things that happened in Second Life™, year by year: Gaming Open Market (GOM), Windlight, the Banking Ban, Ansche Chung, Flexiprims, etc., etc. I realized that every innovation, every highlight, every controversy, every policy change could be written with a sentence that ended: “This was widely criticized as a bad idea, and it was said this would be the end of Second Life.” Every year, Second Life™ has been ending. Free accounts would be the end of it, or whatever, and yet, here we are, ten years on. We have had our dark times. When the Lab laid off so many of its staff right at the end of the M Linden era; then I did worry, but we persisted, even past that. There’s some amazing stuff right now. I am a sucker for mesh stuff, and the materials stuff is amazing too. I don’t think we’ll ever see Second Life™ like it was at the end of 2006 into 2007, the wunderkind, with all the corporations flicking about, but we’ll survive, and grow. SL Newser: Thanks so much Marianne. What a thought-provoking interview. I can’t wait until the world can see your build.